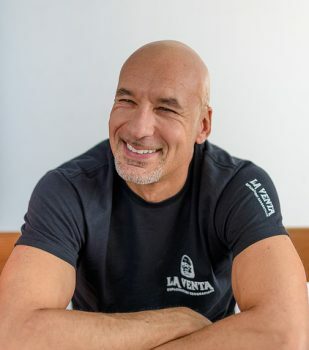 Last month ESA astronaut Luca Parmitano participated in the CAVES eXpedition One, where he joined a scientific expedition organised by La Venta Association and the Commissione Grotte Eugenio Boegan in Cucchiara caves near Sciacca, Sicily. These are his reflections on the experience, presented in original Italian (below) and translated into English. The light on my helmet spreads, soft and misty, almost absorbed by the very high level of humidity that surrounds us. The atmosphere seems unreal – I try to breathe normally: the level of carbon dioxide here is higher than on the surface, and I know by experience that one of the symptoms is the feeling of being ‘starved for air’. Sometimes this happened in orbit, on the ISS, when the CO2 “scrubbers” could not eliminate the excess carbon dioxide. But here it is much worse: even the temperature is high, perhaps not as in the higher galleries where we went to pick up samples, but still enough to make you feel short of breath even without any exertion, leaving us gasping for air and completely dripping with sweat. When I approach the huge ‘window’ in front of me, framing the black emptiness of the still invisible abyss, I turn on the most powerful light beam, pointing upward: this time, it is the scene in front of my eyes that takes my breath away…. My delayed flight from Moscow to Rome and then on to Palermo does not dampen my enthusiasm and the excitement I feel at the thought of entering the cave in the morning. Three years have passed since the “CAVES” experience, where I was underground for 5 days for speleological exploration. But I remember well the feelings that I experienced during training, and the idea of the challenge I will face tomorrow exhilarates me. Cucchiara cave, inside Mount Kronio, above the picturesque town of Sciacca, has absolutely unique characteristics: during the dinner I just had in the company of Cesco (my friend, speleologist-explorer-professor), the various speleologists present competed in describing what awaits me, how to prepare and what difficulties I will have to overcome. Our conversation has done nothing but fuel my curiosity, which in itself does not need any encouragement. The various security briefings and the quick ‘revision’ on the use of climbing material kept us busy all morning. After a quick lunch, we drove towards the opening of Cucchiara cave. The cave is not open for excursions to the public, so there is no ready-made path: we must walk along the pasture on the mountainside, guided solely by the experience of local geologists and the sign of trodden grass of the rustic path formed by the team of speleologists who put safety measures in place yesterday. They fixed ropes inside to allow us to descend and climb up from the various ‘wells’, minimising the risk of accidents. Each of us has brought the material that he/she will need: the suit and speleologist helmet, the harness for descending and climbing, and water. Inside the cave we will encounter temperatures up to 38 °C and humidity of 99.9%: in these conditions the heat transfer necessary to regulate body temperature is extremely difficult; sweating – however excessive – is almost entirely ineffective, and it is necessary to keep hydrated by drinking continuously. I have about 4 litres of water with me, two of which have additional mineral salts: but the weight of the bottles is a comforting thought when I don’t know what exactly what is awaiting me. The entrance of the cave faces directly south, and the sea of Sciacca, with its fresh, salty breeze is extremely inviting: just a few kilometers from here, yet so far away. The marbled blue waves become a vague memory as soon as I approach the first narrow passage. The colors become a blur, and at the beginning everything becomes uniform, until my eyes get used to the dim light. All caves have their own character, different from one environment to another: here, the Venturi effect creates a violent gust of wind, and I have to close my eyes to prevent the swirl of dust from blinding me. But in a moment that wind changes, and I’m immersed in another world. An inner world, warm, humid and dark – ancestral. Instinctively I lower my voice and slow down my movements, so as not to disturb the environment with my alien body. Everything reminds me that I’m just a visitor, and that this world does not belong to me: silence is broken only by our clumsy progress – the fabric of our suits that scrapes against the muddy walls, dust and rock. In this part of the cave, called the “four seasons”, the flow of hot air inside the cave and the cold air drawn from the outside creates a varied microclimate, where it is enough to move just a few inches to feel great temperature changes. The unusual conditions of this place make it a particularly interesting scientific environment, and along with Marco, the scientist in the expedition, we spend about an hour sampling various ramifications. We collect encrusted, crystallized samples from the walls and ceiling and air samples. The colours are striking: yellow, pink, amaranth, red. Everything is covered by billions of tiny droplets of condensation, which, illuminated by our lights, become a silver coat, an inner sky of unimaginable constellations. The heat is asphyxiating: in some of the passages there is no air movement, and the body cannot self-regulate the temperature. I keep drinking plenty of water in short intervals but it gives me very little relief. We move to another location, called “the Crusts”: the huge stone slabs are covered entirely by layers of extremely white crystallised rock, slightly spherical that refract the light. Here, too, we collect some samples, and we measure the atmospheric values: the difference between floor and ceiling is about 70 cm, but the temperature difference is 10 °C! On the other side, in the darkest recesses of the cave, a colony of bats, disturbed by our lights, start to fly: their flight is unreal, silent, dreamlike. Driven by their overdeveloped senses, they disappear into the darkness and silence of the small, invisible galleries that are inaccessible to us. Two hours have gone by since we entered the cave. We only walked a few hundred meters, but I feel that the outside world is far away, and my body is tired as if I had walked miles. We begin the descent to the hardest part of the cave: a narrow well of about 10 meters deep that we will have to descend using our harness. I know the ease with which I descend is inversely proportional to the difficulty of climbing, but for now I try to focus on where to put my feet: the bottom of the shaft is very steep, and I stay tied to the rope to avoid slipping into the damp wet soil. Although gravity is in my favor, I feel my heart rate rising and sweat all over my body, big drops dripping in my eyes: once again, the temperature and the humidity rise, creating a natural barrier against any invaders from the outside. I wait for a moment before I proceed to our destination: the Trieste well, so called in honor of the first explorers who conquered it. From our position, the well is visible through a large slit, called “the window”: the bottom is about 50 meters deep, while the ceiling is 60 meters above us. But in reality, there is no real ceiling: the well continues upwards – following a path that nobody knows – through various chimneys, which can hardly be identified. I approach the window with trepidation, where the temperature rises rapidly: the wall opposite is only partially visible through the beam of light from my helmet. The dimensions are already impressive, but when I point the headlight upwards, I am in awe, while at the same time a smile appears on my face: in the well, the microclimate has created a gigantic cloud, filled with water vapor that turns into rain. My brain struggles to believe my eyes: I am underground in the belly of a mountain – metres down – and I’m looking at a cloud whose rain falls continuously to the ground. Marco places various tools around the window, but we do not have much time: we have to go back up. I have already drank all the water in my backpack, and I fill it with two spare bottles left on the previous day by the exploratory team. Now we are going uphill, and the fatigue of the last hours seems to accumulate at once in my muscles and lungs. Everything becomes a major effort; every breath requires commitment and concentration. 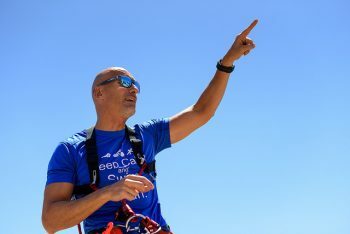 When it’s time to climb the 10-meter well, I put on my harness and look up, I measure the challenge that awaits me: three years have passed since the last time I used this equipment, and my technique is rusty. I hang my backpack below me, trying to be as straight as possible to avoid oscillating. I start climbing, and I feel the sweat running down my forehead and my back. The heat is hell, and my heart seems to have gone mad in the vain attempt to cool my body: but there is no heat exchange, and it is completely useless. I stop after every push, and gradually, slowly, in a time that seems to dilate in the dark, I get to the top. I look at my companions: everyone has pulled their suits down to their waist, trying to cool down. I did not: the inexperience, and the lack of acclimatization, have played a bad joke on me. Thrusting myself up, on the edge of the rocks, I lay down to catch my breath and regain strength. Immediately the others bring me water: I drink a whole bottle in just a few sips. With the help of my companions, I take the harness off, and finally I can open my suit. The vest I wear underneath it, however light, it is completely soaked: I barely feel any air moving, like someone’s breath – but the sense of coolness is immediate. My heart, which seemed to explode in my chest, began to slow down its frantic run. But I have to wait several minutes before I can move. No one, however, complains: in team games, the pace is based on that of the slowest member. I’m the most inexperienced, and everyone has been in my place at some point during their career underground. From here on, despite the temperature fluctuations, everything is simpler. The tunnels are much more airy: the road seems shorter as I recognize the areas we crossed only a few hours before. We did all the sampling during the downhill phase, so we won’t have any other interruptions and can avoid the hottest environments: within twenty minutes or so we are at the narrow passage by the entrance, with what now seems icy cold wind that makes our soaked clothing stick violently to our skin. The setting sun is almost blinding when coming from complete darkness. The sea view welcomes us, its eternal blue reminding us that on the outside time has continued to pass, indifferent to what I was experiencing. My inner sense of time, on the other hand, was not: it expanded, together with my mind, to make space for everything I saw and tried. I know that today will be much easier, if nothing else because I know what I’m expecting, and in a sense I’m already acclimatized: but above all because I decided I would wear my caving suit half-open, following the example of the most experienced. The first stage is an area of the cave that we had not visited yet, called ‘Bats Gallery’ in honour of a large colony that resides there, a different species from the one I saw yesterday. The descent takes place without interruption and in silence; we are all focused on the most demanding passes. To get to the gallery, where Marco and I will do some sampling, we need to descend to the Trieste well/shaft and then follow a path that branches out from there. The bats gallery. The ground is completely covered with guano: Marco explains that they only partially study the interaction between organic matter and the rock on the ground and the walls, and our aim is to sample some of the crystals that are found around them. One perceives the presence of bats not only through the pungent odour of the guano – rich in nitrates – but also by the sound they make: I hear them communicating, with modulated, complex squeaks, echoing from one gallery to the other. Here the temperature is much lower than in the shaft, and sampling proceeds smoothly. Meanwhile, Cesco and another team member move away to explore another gallery, which does not appear complete in the map at our disposal. After about forty minutes, we all meet up at the entrance of the gallery: Cesco found a passage to another branch, not mapped, that continues to who knows where. It would take an hour to widen the passage: but this is an adventure for another expedition – ours has another immediate goal. We move to the window on Trieste well, reluctantly leaving behind the relatively cool gallery we came from. The humidity and warmth here are a tangible entity: it’s like being swallowed by an alien creature, like in an old science fiction film. We are about to begin experimenting with a new system, and we approach a group of people who, near the window, are finishing their preparations. I am very curious. 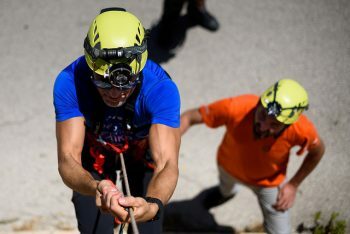 About an hour after we enter the cave, in fact, a second team escorted two engineers, French and Italian, part of a team of four enterprising young people, inventors of the Flyability project. The main part of the system we are going to test is a drone, a quadricopter (called Elios) modified with an outside cage guard. 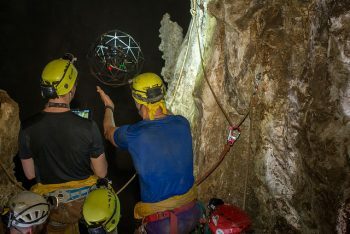 The drone is remotely radio controlled through two monitors and a camera with different sensors: the idea is to use it to reach the farthest wall of the Trieste shaft and explore entrances that are not yet visible. The two engineers follow Cesco’s instructions to drive the drone in the most interesting areas: I am happy to launch and recapture the drone at the end of each test. The results are immediate: despite the humidity and the heat, the quadricopter behaves perfectly, and its cameras provide us with high quality images. Thanks to the infrared sensor, we can identify two openings, one very large, from which the hot air fills the well, which is a very important discovery obtained with a technology never used in this field. I could not resist so I ask the two engineers if I can try to pilot the drone: despite having no field experience, I’m sure my test pilot background will come to the rescue; I would also like to be able to give feedback to the Flyability team. The two young men give me a short checklist of flight controls, and in a few minutes I also let Elios fly. My idea is to do very simple maneuvers to not risk losing the drone. I drove it horizontally a few dozen meters from me, at the same height, and then started a slow descent to the bottom of the well: I want to try to land it, then turn the camera 360 degrees. When the lights illuminate the ground below, I understand that landing will be more complicated than I thought, because the terrain is disconnected, full of stones of varying sizes and with little room to rest the drone. I can only manage it on the third attempt. But the show was worth it, because now the LED lights of the drone illuminate the bottom much better than we could with our headlights: an almost Moon-like landscape, gray stones, collapsed from the ceiling. Differentiating this environment from that of the Moon is the constant rain that continues to fall. Takeoff is much simpler, upright, and within a few seconds I can pilot the drone into the hands of one of the engineers. I can relax: the only advantage in being completely wet with sweat is that no one has noticed how much concentration I needed to bring the quadricopter back – unharmed and whole. We are again on the surface: behind me, the entrance of the cave continues to emit hot air, but the breeze that goes down the mountain side, pouring into the sea, refreshes my skin and also my ideas. As always, I feel like I’ve done something unrepeatable. Indeed, I’m sure that if I went back to this cave, maybe to extend its boundaries and explore its still unknown branches, it would not be the same thing. La luce del faro sul mio casco si sparge, soffusa e appannata, quasi assorbita dall’altissimo livello di umidità che ci circonda. L’atmosfera sembra irreale – fatico a respirare normalmente: il livello di anidride carbonica qui è superiore rispetto alla superficie, e so per esperienza che uno dei sintomi è la sensazione di ‘fame di aria’. In orbita, sull’ISS, a volte succedeva, se gli ‘scrubber’ di CO2 non riuscivano a eliminare l’anidride carbonica in eccesso. Ma qui è molto peggio: anche la temperatura è elevata, forse non come nelle gallerie più alte dalle quali siamo passati per raccogliere campioni, ma comunque abbastanza da rendere il respiro affannato anche senza fare sforzo, lasciandoci a boccheggiare, completamente grondanti di sudore. Il ritardo del volo che da Mosca mi ha portato a Roma e poi a Palermo non è riuscito a smorzare l’entusiasmo e l’emozione che provo al pensiero di entrare in grotta domattina. Sono passati 3 anni dall’esperienza di CAVES, in cui sono stato per 5 giorni sottoterra in esplorazione speleologica, ma ricordo bene le sensazioni provate durante l’addestramento e mi eccita l’idea della sfida che avrò davanti domani. 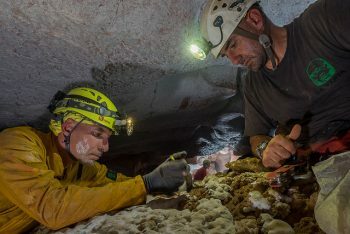 Grotta Cucchiara, all’interno del Monte Kronio sovrastante la pittoresca cittadina di Sciacca, presenta delle caratteristiche assolutamente uniche: durante la cena appena finita in compagnia di Cesco (il mio amico speleologo-esploratore-professore), i vari speleologi presenti hanno fatto a gara nel descrivermi cosa mi aspetta, come prepararmi e quali difficoltà dovrò superare. La nostra conversazione non ha fatto altro che alimentare ancora di più la mia curiosità, che già di per sé non ha bisogno di alcun incoraggiamento. I vari briefing di sicurezza e il veloce ‘ripasso’ sull’utilizzo del materiale da scalata ci hanno impegnato tutta la mattina. Dopo un pranzo veloce, ci spostiamo in macchina verso la bocca di ingresso della Cucchiara. 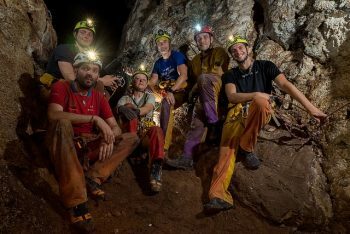 La grotta non è aperta a escursioni per il pubblico, quindi non c’è un percorso pronto: dobbiamo incamminarci lungo la sterpaglia sul fianco della montagna, guidati solo dall’esperienza dei geologi locali e dal rustico percorso formato dall’erba calpestata dalla squadra di speleologi che ieri hanno messo la grotta in sicurezza – montando corde all’interno per permetterci di scendere e salire dai vari ‘pozzi’ minimizzando il rischio. Ognuno di noi porta con se il materiale di cui avrà bisogno: la tuta e il casco da speleologo, l’imbragatura per la discesa e la risalita, e acqua. All’interno della grotta incontreremo temperature fino a 38 °C, e un’umidita del 99,9%: in queste condizioni lo scambio termico necessario per regolare la temperatura corporea è estremamente difficile, la sudorazione – per quanto elevata – è quasi del tutto inefficace, ed è necessario mantenersi idratati bevendo in continuazione. Ho con me circa 4 litri di acqua, due dei quali con sali minerali aggiuntivi: ma il peso delle bottiglie è quasi un conforto, non sapendo bene quel che mi aspetta. L’ingresso della grotta guarda direttamente a sud, e il mare di Sciacca, con la sua promessa di brezza, salsedine e frescura, è estremamente invitante: pochi chilometri, eppure così lontano. L’azzurro variegato delle sue onde diventa un vago ricordo già nel momento in cui affronto la prima strettoia; i colori si sfocano, e tutto diventa inizialmente uniforme, finché i miei occhi non si abituano alla luce bassa. 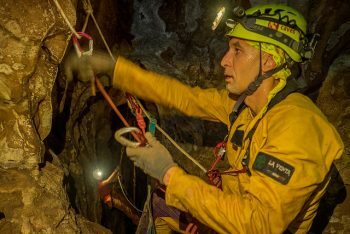 Tutte le grotte hanno un loro respiro, diverso da un ambiente all’altro: qui, l’effetto Venturi crea un soffio violento, e devo chiudere gli occhi per evitare che il turbinio di polvere mi accechi. Ma in un istante quel respiro cambia, e mi trovo immerso in un altro mondo. Un mondo interiore, caldo, umido e buio – ancestrale. Istintivamente abbasso la voce e rallento i miei movimenti, per non disturbare l’ambiente con il mio corpo alieno. Tutto mi ricorda che sono solo un visitatore, e che questo mondo non mi appartiene: il silenzio è rotto solo dal nostro avanzare goffo – il tessuto delle nostre tute che striscia contro le pareti di fanghiglia, polvere e roccia. 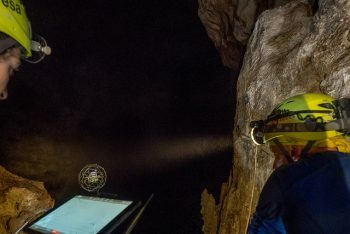 In questa parte della grotta, chiamata delle “quattro stagioni”, il flusso di aria calda proveniente dall’interno e quella fredda aspirata dall’esterno crea un microclima variegato, in cui basta spostarsi di qualche centimetro per sentire grandi sbalzi di temperatura. Le condizioni fuori dal comune ne fanno un ambiente particolarmente interessante dal punto di vista scientifico, e insieme a Marco, il membro scientifico della spedizione, passiamo circa un’ora a campionare varie ramificazioni, raccogliendo incrostazioni cristallizzate dalle pareti e dal soffitto e campioni di atmosfera. I colori sono sorprendenti: giallo, rosa, amaranto, rosso. Tutto è ricoperto da miliardi di minuscole goccioline di condensa, che illuminate dai nostri fari diventano una coltre argentata, un cielo interiore di improbabili costellazioni. Il caldo è asfissiante: in alcune delle ramificazioni non c’è alcun movimento d’aria, e il corpo non riesce ad autoregolare la temperatura. L’acqua, che bevo copiosamente a brevi intervalli, dà pochissimo sollievo. Ci spostiamo in un altro ambiente, chiamato “Le croste”: degli enormi lastroni di pietra sono interamente ricoperti da strati di cristallizzazioni bianchissime, dalle forme vagamente sferiche che rifrangono la luce. Anche qui raccogliamo alcuni campioni, e misuriamo i valori atmosferici: la differenza tra pavimento e soffitto è di circa 70 centimetri, ma la differenza di temperatura è di 10 °C! In disparte, nei recessi più bui della grotta, una colonia di pipistrelli, disturbata dalle nostre luci, inizia a volare: il loro volo è irreale, silenzioso come un ricordo onirico. Guidati dai loro sensi ipersviluppati, svaniscono nel buio e nel silenzio di piccole gallerie invisibili e a noi inaccessibili. Sono passate circa due ore dall’ingresso, abbiamo percorso solo poche centinaia di metri: ma ho la sensazione che il mondo esterno sia lontanissimo, e il mio corpo affaticato come se avessi percorso chilometri di distanza. Ricominciamo la discesa, verso la parte più difficile della grotta: uno stretto pozzo di circa 10 metri che dovremo scalare utilizzando la nostra imbragatura. So che la facilità con cui scendo è inversamente proporzionale alla difficoltà di risalita, ma per adesso cerco di concentrarmi su dove poggiare i piedi: il fondo del pozzo ha una inclinazione molto ripida, e resto vincolato alla corda per evitare di scivolare nel pericolante terriccio umido. Nonostante la gravità sia a mio favore, sento il battito cardiaco elevato e il sudore che mi ricopre il corpo, grosse gocce che mi cadono davanti agli occhi: di nuovo, la temperatura e l’umidità si alzano, creando una barriera naturale contro invasori provenienti dall’esterno. Mi fermo a riposarmi un attimo, prima di continuare verso la nostra destinazione: il pozzo Trieste, così chiamato in onore dei primi esploratori che lo hanno affrontato. Dalla nostra posizione, il pozzo è visibile attraverso una grossa fenditura, chiamata “il finestrone”: il fondo è a circa 50 metri, mentre il soffitto è a 60 metri sopra di noi. Ma in realtà, non c’è un vero soffitto: attraverso vari camini, difficilmente individuabili, il pozzo continua verso l’alto – seguendo un percorso che nessuno conosce. Mi avvicino trepidante al finestrone, dove la temperatura si innalza rapidamente: con il fasci di luce del mio casco, la parete di fronte è solo parzialmente visibile, a varie decine di metri di distanza. Le dimensioni sono già impressionanti, ma quando sollevo il faro verso l’alto, resto pietrificato dallo stupore, mentre al contempo un sorriso di sorpresa si disegna sul mio volto: all’interno del pozzo il microclima ha creato una gigantesca nuvola, talmente satura di vapore acqueo da trasformarsi in pioggia. Il mio cervello fatica a credere ai miei occhi: sono sottoterra, nel ventre di un montagna – a metri e metri di profondità – e sto osservando un nuvola, la cui pioggia cade continuamente verso il fondo. Marco sistema vari strumenti nei dintorni del finestrone, ma non abbiamo moltissimo tempo: dobbiamo risalire. Ho già bevuto tutta l’acqua presente nel mio zaino, e lo riempio con due bottiglie di scorta lasciate il giorno precedente dalla squadra di avanscoperta. Adesso si viaggia in salita, e la fatica delle ultime ore sembra accumularsi in un attimo nei miei muscoli e polmoni. Ogni sforzo sembra amplificarsi, ogni respiro richiede impegno e concentrazione. Quando è il momento di scalare il pozzo da 10 metri, monto la mia imbragatura e, guardando verso l’alto, misuro la sfida che mi aspetta: sono passati tre anni dall’ultima volta che ho utilizzato questa attrezzatura, e la mia tecnica sarà molto goffa. Appendo lo zaino sotto di me, per cercare di essere il più possibile in verticale ed evitare pendolamenti. Comincio la scalata, e sento il sudore imperlarmi immediatamente la fronte, e rivoli che mi scorrono lungo la schiena. Il caldo è infernale, e il mio cuore sembra impazzito nel vano tentativo di raffreddare il mio corpo: ma non c’è scambio termico, ed è del tutto inutile. Mi fermo dopo ogni impulso, e a poco a poco, lentamente, in un tempo che sembra dilatarsi nel buio, arrivo alla sommità. Osservo i miei compagni: tutti hanno tirato giù la tuta fino alla vita, per facilitare la ventilazione. Io no: l’inesperienza, e la mancanza di acclimatazione, mi hanno giocato un pessimo scherzo. Tirandomi a fatica sul bordo del costone di roccia, mi sdraio per riprendere fiato e forza. Subito i compagni mi porgono acqua: ne bevo una bottiglia intera in pochi, voraci sorsi. Con l’aiuto dei compagni tolgo l’imbragatura, e finalmente anch’io posso abbassare la tuta. La maglia che indosso sotto, per quanto leggerissima, è completamente bagnata: sento un movimento d’aria appena percepibile, quasi un alito – ma il senso di refrigerio è immediato. Il cuore, che sembrava esplodermi nel petto, comincia a rallentare la sua corsa frenetica. Ma devo aspettare parecchi minuti prima di potermi muovere. Nessuno, però, si lamenta: nel gioco di squadra, la velocità del gruppo è quella del più lento. Io sono il più inesperto, e tutti si sono ritrovati al mio posto a un certo momento della loro esperienza sotterranea. Da qui in poi, nonostante gli sbalzi di temperatura, tutto è più semplice. Le gallerie sono molto più ventilate: la strada sembra più breve poiché riconosco gli ambienti che abbiamo attraversato solo poche ore fa. Abbiamo effettuato tutti i campionamenti durante la fase di discesa, quindi non abbiamo altre interruzioni e possiamo evitare gli ambienti più caldi: in poche decine di minuti ci ritroviamo alla strettoia di ingresso, con il vento che adesso sembra gelido, incollando violentemente alla pelle i nostri abiti completamente bagnati. Il sole, sebbene prossimo al tramonto, è abbagliante per i nostri occhi provenienti dal buio. La vista del mare ci accoglie, il suo blu eterno a ricordarci che il tempo esterno ha continuato a scorrere del tutto indifferente alla mia esperienza – il mio tempo interno, invece, quello no: si è dilatato, insieme alla mia mente, per fare spazio a tutto quello che ho visto e provato. So già che la giornata di oggi sarà molto più semplice. Se non altro perché so cosa mi aspetta, e in un certo senso sono già acclimatato: ma soprattutto perché ho deciso che farò tutta l’escursione con la tuta speleo a mezza vita, seguendo l’esempio dei più esperti. La prima tappa è una zona della grotta che non abbiamo ancora visitato, chiamata ‘Galleria dei pipistrelli’ in onore di una grossa colonia, diversa da quella che ho visto ieri, e di una specie diversa. La discesa avviene senza interruzioni, in silenzio, siamo tutti concentrati sui passaggi più impegnativi. Per giungere alla galleria, dove Marco e io faremo dei campionamenti, bisogna scendere fino alla quota del pozzo Trieste per poi seguire una diramazione. Galleria dei pipistrelli. Il terreno è completamente ricoperto di guano: Marco mi spiega che l’interazione di materia organica con la roccia del pavimento e delle pareti è solo parzialmente studiata, e il nostro scopo è di campionare alcuni dei cristalli che incrostano l’ambiente intorno a noi. La presenza dei pipistrelli, oltre che dall’odore pungente, ricco di nitrati, del guano, è percepibile anche con l’udito: li sento comunicare, con squittii modulati, complessi, che echeggiano da una galleria all’altra. Qui la temperatura è molto più bassa rispetto al pozzo, e il campionamento procede agevolmente. Nel frattempo, Cesco e un altro membro della squadra si allontanano a esplorare un’altra galleria, che nella mappa a nostra disposizione è incompleta. Ci ritroviamo tutti dopo una quarantina di minuti, all’ingresso della galleria: Cesco ha trovato un passaggio per un altro ramo, non mappato, che continua chissà dove. Ci vorrebbe un’ora di tempo per allargare il passaggio: ma questa è un’avventura per un’altra spedizione – la nostra ha un altro obiettivo più immediato. Ci spostiamo verso il finestrone sul pozzo Trieste, lasciandoci alle spalle a malincuore il fresco relativo della galleria dalla quale proveniamo. L’umidità e il caldo sono qui un’entità tangibile: è come essere inghiottiti da una creatura aliena, come in un vecchio film di fantascienza. Stiamo per cominciare la sperimentazione di un nuovo sistema, e ci avviciniamo a un gruppetto di persone che, vicine al finestrone, sta finendo i preparativi. La mia la curiosità è grande. 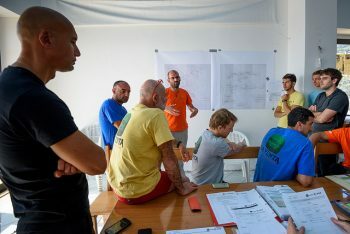 Circa un’ora dopo il nostro ingresso in grotta, infatti, una seconda squadra ha scortato due ingegneri, un francese e un italiano, parte di un team di quattro giovani intraprendenti, inventori del progetto Flyability. Al centro del sistema che andremo a sperimentare c’è un drone, un quadricottero (chiamato Elios) modificato con una gabbia di protezione all’esterno. Il drone è controllato remotamente attraverso un radiocomando, due monitor e una telecamera con diversi sensori: l’idea è di utilizzarlo per raggiungere la parete più lontana del pozzo Trieste, ed esplorare ingressi che al momento non sono ancora visibili. I due ingegneri seguono le indicazioni di Cesco per pilotare il drone nelle zone più interessanti: io mi accontento di lanciare e ricatturare il drone alla fine di ogni test. I risultati sono immediati: nonostante l’umidità e il calore, il quadricottero si comporta perfettamente, e le sue telecamere ci offrono immagini di ottima qualità. Grazie al sensore a infrarossi, siamo in grado di individuare due aperture, di cui una molto grande, da cui sembra provenire l’aria caldissima che riempie il pozzo: una scoperta molto importante, ottenuta con una tecnologia mai utilizzata in questo campo. Non resisto, e chiedo ai due ingegneri se posso provare a pilotare il drone: nonostante non abbia alcuna esperienza in campo, sono sicuro che il mio background da test pilot verrà in soccorso; inoltre vorrei poter dare un feedback al team di Flyability. I due giovani mi danno una breve checklist dei comandi di volo, e in pochi minuti mi accingo anch’io a far volare Elios. La mia idea è di fare delle manovre molto semplici, per non rischiare di perdere il drone. Lo porto in volo orizzontale a qualche decina di metri da me, alla stessa quota, per poi iniziare una lenta discesa verso il fondo del pozzo: voglio provare a farlo atterrare, per poi far girare la telecamera a 360 gradi. Quando i fari illuminano il terreno sottostante, capisco che l’atterraggio sarà più complicato di quello che pensavo, perché il terreno è sconnesso, pieno di sassi dalle dimensioni più varie, e con pochissimo spazio per poggiare il drone. Infatti, riesco a poggiarlo solo al terzo tentativo. Ma lo spettacolo ne è valsa la pena, perché adesso le luci LED del drone illuminano il fondo molto meglio di quanto non fossimo riusciti a fare noi con i nostri fari. Un paesaggio quasi lunare, pietre grigie, crollate dal soffitto: ma a differenziare questo ambiente da quello della Luna, è la pioggia costante che continua a cadere. Il decollo è decisamente più semplice, in verticale, e in pochi secondi riesco a pilotare il drone nelle mani di uno degli ingegneri. Posso rilassarmi: l’unico vantaggio nell’essere già completamente bagnato di sudore, è che nessuno si è accorto di quanta concentrazione ho avuto bisogno per riportare il quadricottero indietro – illeso e intero. surprising one that have been in space is difficult, doing it under a cave is challenging, all done in his own homeland is almost impossible.